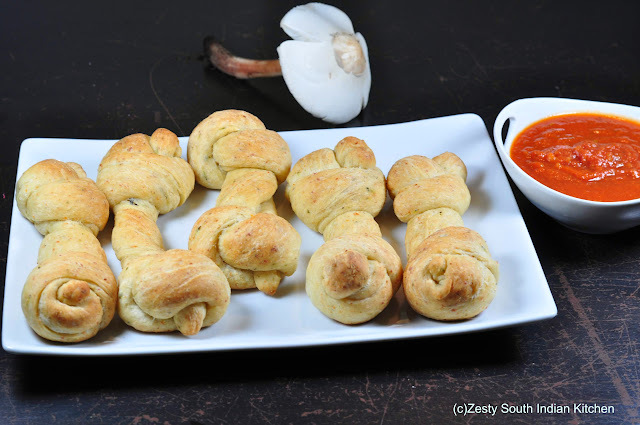 I had bookmarked this bread stick bones recipes on my do to list for last Halloween. However last year I didn’t get enough time as my baby was around 9 ½ month old, and constantly demanding my attention. So this time I thought I will make bread stick bones. Fun part of Halloween is dressing and going for trick & treat. My kids are going to dress up but I am not taking them to trick treat. They will be handing over chocolates as trick-treaters come by. Further Halloween is coming on working day. Halloween means spooky movies, trick treat and costumes. However both I and my hubby are not horror movie fans. I can’t watch them, if I watch I couldn’t sleep for entire night. Somebody needed to accompany me, if have to go to use the restroom in the night. If I am watching Indian Ghost movies, then even the ghost will start singing and dancing to songs. With its white sari and untied hair, I think I horror in that cases feels like a comedy. Last post I mentioned about my experience towards bad bread sticks from PappaJohn’s. However I greatly enjoy the bread sticks from Pizza Hut. 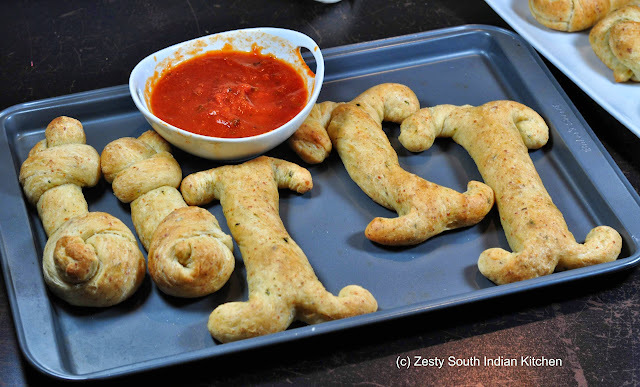 I even try tocreate their breadsticks at home and succeeded to an extent. I won’t say I beat them, still it tasted great. So when I decided to make bread stick bones, I don’t want to use the same recipe, and was finally inspired with this taste of home’s recipe for soft garlic bread sticks. I did not want to use entirely bread flour, as they tend to make the breads little chewy to our taste buds, and used a combination of bread flour and All Purpose flour. In the bread stick dough I used Parmesan cheese, dried parsley, marjoram, thyme, black pepper, rosemary along with fresh basil. My basil plant is growing really well, and I always think that I am going to make basil pesto, but that day has not yet come. So I decided to use it in my bread stick. I also used garlic and onion powder, and trust me I used every herbs and spices available in pantry to make it really herbed bread sticks. I had to change the recipe as the original one is using bread machine, and I don’t have one in my hand. 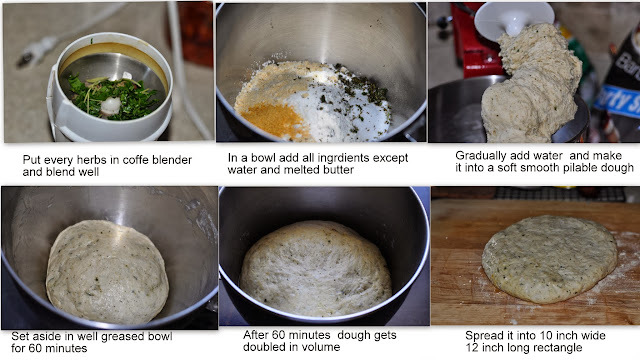 I made the dough with Kitchen Aid stand mixer and allowed it to ferment for 60 minutes to double. Then divided into two pieces and tried two different shaped bones. First one is adapted from serious eats and second shape is from here. 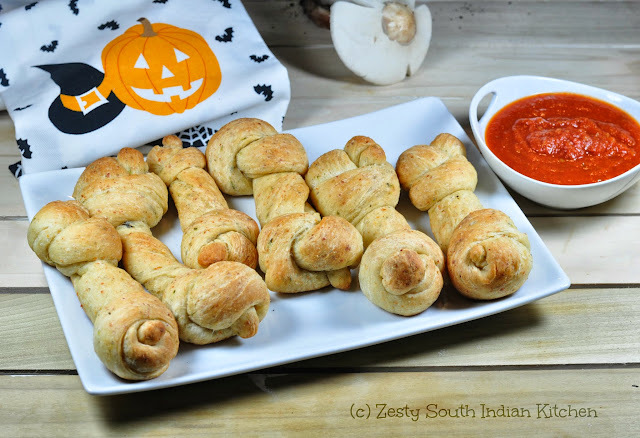 I know it is not that spooky, but I tried my best to bring out my artist for making this bone shapes, it turned out be okay still needs lot of room for improvement Trust me they are delicious bread sticks even my son love to eat with marinara. So if you are planning for a Halloween party in your backyard, you can try this. It is delicious not doubt about that. 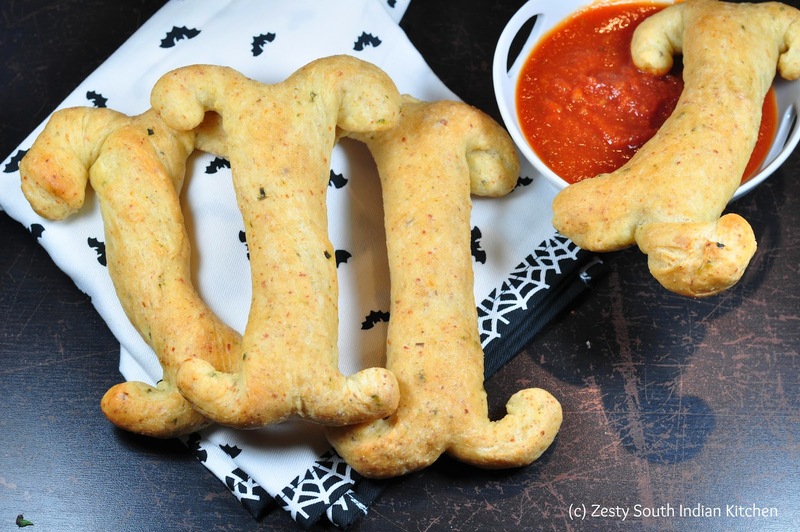 May be you can make them little more spooky by adding some marinara in the bones itself. I am planning to make few spookier treat, so stay tuned for that. Here comes the recipe, you can also make them into normal shape as they are delicious. Transfer to a well greased bowl cover with plastic wrap and damp towel and set aside for 1 hour or double in size. Once it is doubled transfer the dough to work table and spread it into 10 inch wide and 12 inch rectangle. Then cut it in the center to create two pieces. Then with one half, cut into 10 inch long and 1 ½ inch wide pieces. 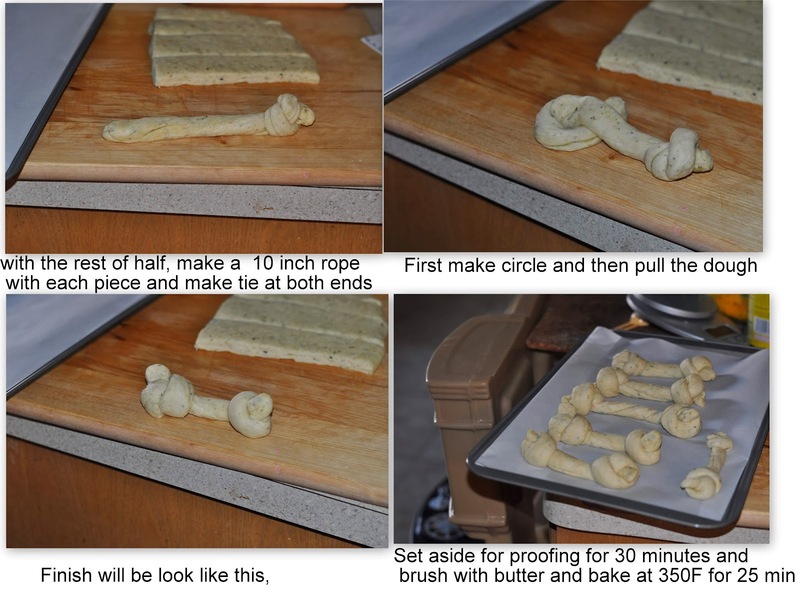 For the bread sticks shaped as serious eats article roll each piece into a single rope and tie knot at each end. Transfer to baking sheet lined with parchment paper and set aside for doubling for another 30 minutes. 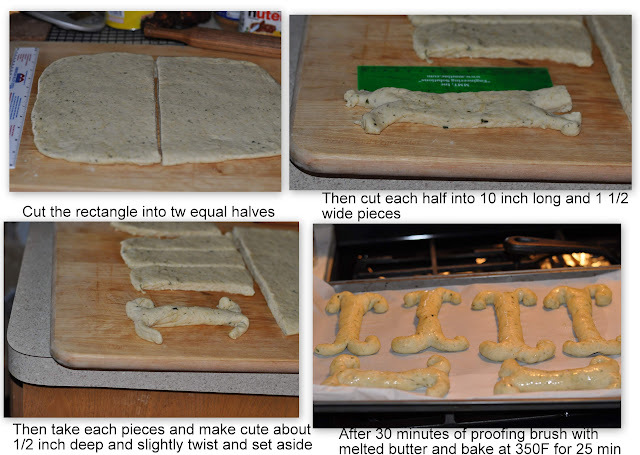 Then with second part of dough cut it into 10 inch long and 1 ½ inch wide pieces. Then at the each end make a cut at 1 inch deep (I think making ½ inch is enough mine was little longer) so that you can make a small twist on each ends. Set aside for proofing for another 30 minutes. By the end of the second proofing, preheat oven to 350F. Brush the sticks with melted before going into oven. Bake for about 25 minutes or until golden brown. Remove from the oven and again brush them once again with melted butter. Set aside for cooling in the pan for about 5 minutes and then transfer to wire rack. Serve with marinara while they are warm. Hey dear, these looks very cute. And loved your blogs look. beautiful luking bread bones sticks…cute…u baked well n expalined good. such a fun idea that is. my son would love it. cutie pie bone bread sticks which look perfect. Beautiful bones ,,,You are already ready for Halloween love the way u r organized. Such a neat idea Swati, love it. A perfect treat for halloween and I hate scary movies, i still shiver thinking about Sixth Sense..
Yummy and cute bones, looks delicious. Wow , Lot of hardwork done for this recipe . Good post . Nice and cute bread sticks! These are super cute Swathi! I’m pinning them and saving them for later! I’m not big on horror movies either so we usually forgo ghost movies! Have a great week! Swathi, such a cute and creative concept for Halloween…not to mention how yummy and fun to eat watching scary movies. Love the other form of rolls, as well, but certainly kids would have lots of fun and adults as well, to enjoy the ‘bones’! These bread bones are so cute! What a fun idea! I am the same way about horror movies! I can’t even watch the commercials.